New lower profile antenna design that can facilitate up to 6 cables. Example configuration two connections for Global LTE (694-3700 Mhz), three connections for WiFi (2400-2500, 5000-6000 MHz), and one Glonass connection (1575 MHz/1612 MHz). 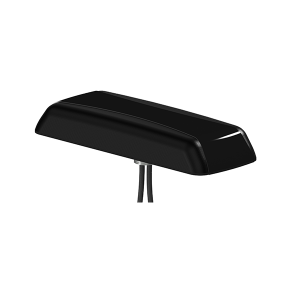 This reduced profile design is a perfect fit for surface mounted applications that require combined functionality for several wireless frequencies.